My opinion about food courts is still being formed. I have too many points in favour and against the notion, to reach a definite ‘love’ or ‘you what?’ verdict. The range of approaches and quality of executions of food courts is partly to blame for this. I know where I stand with food markets. They are always a good thing. You can pick up fresh produce and, almost inevitably, there are clever folks who prepare fresh food for hungry punters to eat before shopping. I say before shopping because buying ingredients while hungry is a recipe for over-buying and food should never be wasted. Think of the Boqueria in Barcelona or Borough Market in London and the first ingredients that come to mind are the most typical of the region and the season. These and other food markets started out as a collection of sellers that provided the community with ingredients and as demand for food that could be eaten on-site increased, so did the number of stalls that sold prepared or cooked food. The marvellous metal structure of the fabulous Les Halles de Dijon may or may not have had Mr Eiffel designing part of the metalwork but in any case, it houses some of the most formidable sellers of produce in the Old World. Food courts don’t share these noble origins. They are a more recent expression of hyper-consumption, originally included within large malls so that shopping is not brought to an abrupt end by a mealtime – one shops, briefly pauses to fill one’s stomach and then goes on shopping. In many cases, they are filled with food that is destined for quick service and even quicker consumption. Across the Atlantic, I’ve been to the most depressing of incarnations of a food court, where concessions rent out little patches of a basement hall, to serve concoctions that are only edible if your definition of the word is as elastic as the noodles they sell. Happily, some shopping complexes get it right. Particularly in countries where food is actually important to the public, even the most shabby-looking collection of eateries within the most depressing of supermarkets can rustle up meals that one can’t reasonably turn one’s nose upon. So, there’s my issue. I can’t just write them all off as a bad idea or claim to like all food courts. I have to visit them to form an opinion. There’s a new one in St Julians, forming part of the tastefully designed Spinola Park and I figured it would be worth a visit. There’s an interesting spread of eateries that include pizza, a couple of ways to Asian food, a superb meat offering and even a lovely café. However, the place that caught my eye was a fish restaurant simply called Pescado. That’s Spanish for fish that’s been caught and destined for my belly, so it augured well. I was there at lunchtime and I ordered the Pescado toss, mainly because the fish in this dish is served raw so there wouldn’t be a long wait for it to be prepared and served. Well, served is only half accurate. It’s one of those places where you place your order at the restaurant you’ve chosen and are given a little beeper. When the food’s ready, your beeper panics and this is a sign for you to go and collect your food. The layout is great. Unlike other food courts that feel awkward and crammed, this one has plenty of space inside and a large terrace outside. Seating is clever because it includes booths with curved banquettes to regular tables, high tables and comfy seating on the terrace. 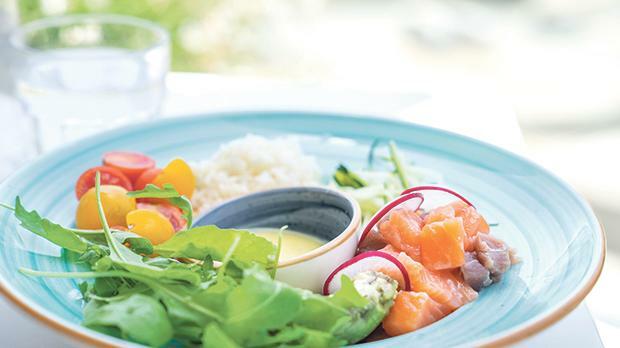 The Pescado toss is essentially a salad, with a generous serving of cubed salmon and tuna alongside shredded courgette, avocado, cherry tomatoes, plain rice and a bowl of dressing. At €10, this meal costs a little more than a fast-food meal deal and is in fact the real deal. It’s full of flavour, virtuously healthy and is attractively presented. Only I’d seen chowder on the menu and I had to return to try it. My next visit was for an early evening meal. The place is much quieter in the evening and everyone is a little less hurried. This time I decided I’d put Pescado through its paces and ordered like I’d do at a restaurant rather than settling for a quick bite. First, I picked out a bottle of Greco di Tufo, wanting the biting crispness to dance with a creamy chowder. Then, I picked a few small dishes as starters, a couple of main courses and waltzed to a table on the terrace with an ice-bucket in hand. The sun was just setting when we sat down and from up there one has the unlikely view of the top side of Tigullio, that rips through the valley like an oddball collection of science-inspired blobs. Our beeper beeped. I picked it up and tried not to run to my food. I’d make a terrible waiter because I could never suppress my enthusiasm when around food and I would surely trip up with some poor patron’s dishes. Somehow, I made it back to our table with everything intact. We’d decided to share our starters and this is a little tricky when one of the dishes consists of three oysters and a little tub of fish roes. Luckily, I’m more of an oyster fan than my partner is, so I snagged two of them and she seized the lioness’s share of the gin-cured salmon. I’ve paid more for a single oyster than I had paid for three at Pescado and while they’re not the best I’ve sampled, they are perfectly serviceable. The roes had been, in my view, unnecessarily sweetened but I wasn’t about to complain. I find salmon hugely more enjoyable when it’s been sensibly cured than when it has been poorly smoked. The gin doesn’t quite leap so much as present itself as a subtle hint and I found the salmon, when eaten alone, to be overly salted. That’s an unfair assessment, however. The dish includes cherry tomatoes, julienned courgette, mayonnaise, rucola and a sprig of fennel. Taking a bite of salmon with another two or three of the components of the dish forms a much more pleasant mouthful. The young lady who served us at the counter had asked me to keep my beeper because she’d have to call me back again for our second course. Once again, the wait was perfectly respect­able. While we waited, one of the uniformed staff of the food court itself cleared our table and asked how our meal was. It isn’t much in terms of table service but is all one really needs at this kind of establishment. The seared sea bass is served with pistachio sauce and ground pistachio, on top of grilled fennel and a rucola, along with a salad that had little bits of orange zest for colour and smell. The fillets are grilled so the skin crisps and the flesh remains juicy, the seasoning is the right kind of restrained and I absolutely loved the fennel. I’ve paid nearly twice as much for fish that’s almost as good as this. My chowder looked the part. 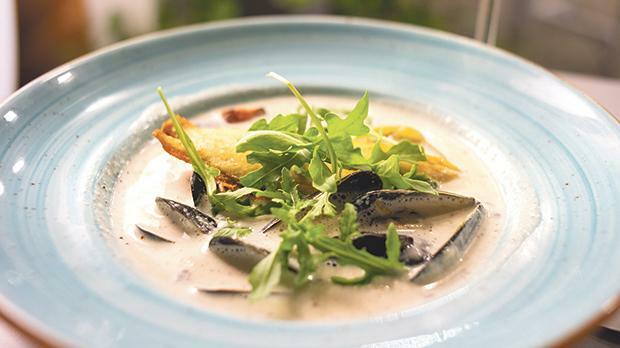 It’s served in a large bowl that’s an attractive shade of teal, which is filled with mussels, bits of deliciously soft potatoes and a delicious filled of crisp, smoked trout. A chowder is usually somewhere between our aljotta and a bouillabaisse if I can provide a reasonable indication of viscosity and richness, with the clam that forms the bulk of the fish varying from a hint to a powerful flavour. This one is well-balanced, creamy and a little thin so adding bits of the trout or dipping into one of the mussels makes for a very pleasant result. There’s a hunk of toasted Maltese bread on the side to dip and to thicken. More importantly, it is the touch that localises the dish. We paid less than €60 for the lot, showing that it is possible to serve seafood in an informal setting without over-charging for it. It’s early days for Pescado and if I were to wish for additions that could complement their offering, I’d suggest locally sourced fish like mackerel when it’s in season – to keep the price low and to match the food-market feeling that it has going for it. It’s been a while since I have been keen about the future of a fledgling restaurant and this is one I am keeping my eyes on.